All you need to do is email me with your order before 9.00pm Friday night and you’ll still be in time. For every $100 you spend you get to choose one of the four limited edition stamps sets. The above card was made with Birthday Whimsy. Don’t forget too … you can make the most of the retirement list being announced early and grab some retiring sets before they go and at the same time earn yourself a free Sale-a-Bration set! It’s a win/win time for stampers!! It’s time to revisit your Stampin’ Up! wish list! Why? Because Stampin’ Up! have released their catalogue retirement list a little earlier this year … and it’s pretty long. This is a card I made exactly from page 48 of the catalogue … Nice & Narrow stamp set … it’s going to be gone! This is a card I made using the same layout as the Nice & Narrow card (above) except I used other colour card stock and stamps from my own collection. One of the stamps I used was the cake from Bloomin’ with Happiness (hostess set) … and that stamp set is going to be gone too! Although we will all be sad to see so many products go, it is also an exciting time because it means our new catalogue, out on 1 April 2008, must be filled with some awesome and exciting new products!! I can’t wait!! So, have a browse at the list below and, if you really want something, order now before everything goes. The items on this list are only available until 31 March 2008 or until sold out, whichever is earlier. After that, they are gone forever (except perhaps on Ebay). The items listed in YELLOW have a limited quantity (already!!!) and may run out soon. Items in RED are no longer available (already!!). The best advantage for you is , with the retirement list out now and Sale-A-Bration still running until 29 February 2008, you can order from the retirement list, spend $100 and receive a FREE Sale-A-Bration stamp set. For my customers too, I’m offering 15% off all retiring items. So place your order with me today! It really was so easy to do … pick two complementary colours, stamp one colour on a solid stamp and then use a Stampin’ Around wheel inked up with the other colour and roll/twist it on the other stamp. Give a ‘huff’ and stamp on your cardstock. I chose Apricot Appeal and Real Red as my complementary colours. Would you try this technique? I think the colours Pretty in Pink and Chocolate Chip look really lovely together. What do you think? Well, it’s not a 12×12 scrapbook! But I have scrapped my first ever 6×6 album. I wanted to start small before I tackle anything too big! 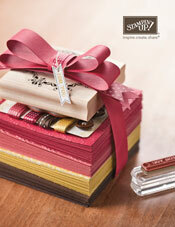 When I joined Stampin’ Up! I chose the Stampin’ Memories Add On … which meant for only $75 I received an alphabet stamp set, a linen 6×6 album, a Simply Scrappin’ Kit, an assorted pack of 12×12 cardstock and a Stampin’ Write black journaler. Truly, such awesome value I could not go past it. And the gorgeous outfit? A special Christmas present from Aunty Iesha which was brought back from China for Bella. Notice the car? A WRX, no less! A Christmas present from Grandma. What do you think of my first attempt? Leave a comment! Who wants to be organised for some birthday cards this year? Well, then, it’s Stamp-A-Stack time! What is a Stamp-A-Stack, you ask? Well, simply, we sit down and make a stack of 10 cards, 5 of 2 different designs. How much will that cost? Well, how much do you pay for a handmade card at a card shop? $8-$10 or thereabouts? each card?? Well, for your very OWN handmade creations that are clearly more special to your friends and family than someone else’s handmade creations … it will cost only $20 for 10 cards including all materials. An optional $3.00 extra is payable if you would like lovely envelopes to go with your cards that you can stamp to coordinate with the cards you have made. Interested? Well, book Monday 25 February 2008 into your calendar … 7.30pm at my place, 7 Parklea Drive, Parklea. The design of this card is completely inspired by Marelle Taylor, one very talented Stampin’ Up! demonstrator. Thanks, Marelle! And this is the other card … something completely different! Bookings for my classes are essential. Please contact me no later than Saturday 23rd February 2008 to ensure your place. Looking forward to seeing you at my place! If you cannot make it, then why not organise a minimum of 4 people together (including yourself) and book me to visit your home for a personalised card making class? Contact me today to arrange a date! Would you like to come but your diary is already booked that night? Well, subscribe to my blog to have your finger on the pulse and know when the next class you might like to attend is on. Thanks for looking! PS. this is a card I considered for the SAS, but I think it would be a late night cutting out the cupcake five times … what do you think? You can always tell when the new year has settled in … life gets busier. So, with a few workshops done recently and a few more on the way, here are some more thank you cards I have made for my hostesses. The card below uses the stamp set, Merci, which is one of the FREE Sale-A-Bration stamp sets you can only receive if you place an order over $100 BEFORE 29 FEBRUARY 2008. Time is counting down for these sets to be gone forever … so if you love it and want it, order today! The gorgeous Flirty pink ribbon and stunning chocolate/vanilla spotted paper will also be gone soon, but you have until 31 March 2008 to place your orders for them. A good reminder for your diary, the Summer Mini Catalogue ends next month! Which thank you card do you like best? Leave a comment.